Union Group of Illinois has told city offcicials they want to open the dispensary in a vacant storefront at 6428 N. Milwaukee Ave.
NORWOOD PARK — Ald. Mary O'Connor (41st) vowed Tuesday to oppose a medical marijuana clinic that wants to open near Superdawg, even though an owner of the iconic Chicago hot dog stand and drive-in welcomed the idea. Union Group of Illinois wants to open a dispensary in a vacant storefront at 6428 N. Milwaukee Ave., city officials said. The firm was one of two groups to win a state license to operate a medical marijuana dispensary in Jefferson Township, which includes most of the Far Northwest Side. The firm, based in northwest suburban Prairie View, near Buffalo Grove, has not yet asked city officials for a special-use permit to open the dispensary, records show. But O'Connor said she would oppose the proposal for a dispensary near Milwaukee and Devon avenues, kitty-corner to the home of what many natives believe is the best Chicago hot dog, Superdawg. 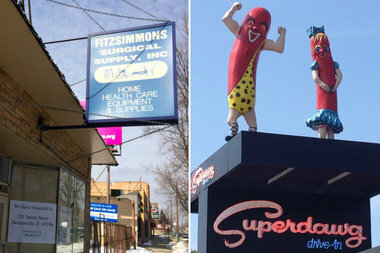 But Superdawg co-owner Scott Berman, whose parents Maurie and Flaurie founded the restaurant at 6363 N. Milwaukee Ave. in 1948, welcomed the idea of a marijuana dispensary so close to the drive-in. "We're in favor of anything that brings customers to the area," Berman said, adding that it would be nice to see a vacant storefront filled. "This will help people," Berman said. "I see it no differently than a doctor's office or dentist's office opening there." The city's Zoning Board of Appeals will decide whether to issue Union Group of Illinois a special-use permit and allow the dispensary to open in a now-empty former surgical supplies store across from the Caldwell Woods Forest Preserve. The board often, but not always, follows the recommendation of the alderman for projects in his or her ward. Curative Health is set to open the other dispensary on the Northwest Side in Jefferson Park near Lawrence and Milwaukee avenues. Union Group of Illinois owner Dmitrey Stebley could not be reached for comment Tuesday. After his firm won the license from state officials he said he did not know where the dispensary would be located, and referred questions to his firm's administrator, who did not respond to requests for comment from DNAinfo Chicago. Of the seven companies that applied for one of the two medical marijuana licenses available in Jefferson Township, Union Group of Illinois submitted the top-rated application as judged by state officials during former Gov. Pat Quinn's administration. The applications were ranked based on a variety of criteria, including business plan, security, expertise and community benefits, state officials said. However, because the state law launching the four-year medical marijuana pilot program in Illinois ordered that the applications be kept private, it is not clear precisely why Union Group was so highly rated, who is backing it financially or what its plans are for its Jefferson Township facility. Gov. Bruce Rauner followed most of the recommendations made by Quinn administration officials in issuing medical marijuana dispensary licenses Feb. 2. Dispensaries must be 1,000 feet from schools and day care centers and can't be in residences, according to city regulations.